Whether you plan to be a veterinarian, public health nurse, environmental specialist or a physician, you will want to play an integral role in developing One Health — the future of global health care. One Health is a global initiative that encourages collaboration among all health disciplines with the goal of attaining optimal health for people, animals and the environment. This annual three-day workshop will introduce you to the concept of One Health. Throughout the weekend, you will interact with high-calibre One Health leaders from across North America. Group discussions and social events also give you time to meet other students from your own college as well as from other U of S colleges and schools. The 2019 U of S One Health Leadership Experience will be held from Friday, Aug. 23, to Sunday, Aug. 25, in Saskatoon, Sask. One Health is "the collaborative effort of multiple disciplines — working locally, nationally and globally — to attain optimal health for people, animals and the environment." This international movement recognizes that the health of humans, animals and the environment are interconnected. Why is One Health critical to your careers? Many infectious diseases such as rabies, tuberculosis, West Nile virus, anthrax, SARS and highly pathogenic influenza are transmitted between animals and humans. Tens of thousands of Canadians annually suffer from food- and water-borne illnesses — some with serious consequences such as renal failure — that are caused by food safety issues in the global food chain. Preventable medical errors cause thousands of deaths every year — some simply due to mistakes in interprofessional communication. Animals have measurable, positive effects on the health of people who are suffering from obesity, hypertension, post-traumatic stress disorder (PTSD) and other conditions. What are the conference requirements? Participation is also encouraged from the University of Regina's Faculty of Social Work. If you are interested in attending the conference and are enrolled in another U of S college or school that is not listed above, please email ohle.info@usask.ca. Participation: Maximum of 200 students. Registration for the 2019 One Health Leadership Experience will open in June 2019. The U of S One Health Leadership Experience is a three-day event that provides plenty of opportunities for health science students to learn more about One Health from some of the world’s leading experts in the field. It’s also the ideal chance for students from all different disciplines to meet and explore ways in which health professionals can work together toward the goals of One Health. HERS-EA is a sister organization of Higher Education Resource Services, an educational, non‐profit organization based in the U.S. providing leadership and management training for women in Higher Education Institutions. Zoetis believes the development of sophisticated tools and technologies to protect companion animal health and to support livestock farming can have a significant positive impact on public health and the global supply of safe and affordable food. Animals and humans share many diseases. Providing solutions for newly emerging infectious diseases in animals helps to protect the health of humans. Zoetis has supported the U of S One Health Leadership Experience since the student conference was established in 2012. The Western College of Veterinary Medicine (WCVM) is the premier centre of veterinary education, research and expertise in Western Canada and a key member of Canada's veterinary, public health and food safety networks. More than 450 undergraduate and graduate students are enrolled at the internationally-recognized veterinary college that includes a veterinary medical centre, a provincial diagnostic laboratory and large-scale research facilities. One Health is an integral part of the veterinary college’s education, research and clinical programs. The WCVM is the lead organizer for the U of S One Health Leadership Experience. The mission of the U of S Council of Health Sciences Deans is to enhance the capacity for high quality health care. The council meets this goal by enabling the education of a new generation of health care practitioners with skills in interprofessional health care and health promotion, promoting excellence in interdisciplinary health research and sharing in outreach and community engagement. The council’s members include leaders of all health science colleges and schools on the U of S campus. 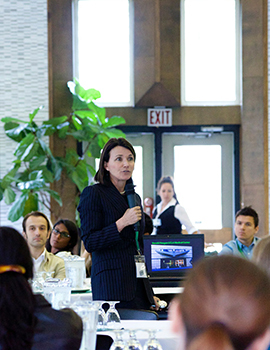 The U of S Council of Health Science Deans has supported the U of S One Health Leadership Experience since the student conference was established in 2012. The University of Saskatchewan's "Bringing One Health to Life" presentation series takes place during the winter months each year. The series' goal is to provide USask students the opportunity to learn more about different aspects of One Health and to gain insight into the wide range of professions and jobs that are linked to One Health. USask students and members of the university community are welcome to attend these evening sessions that always begin with a hot supper and a chance to meet classmates and colleagues from across campus. We hope you can attend one or all three of the sessions that will take place on January 29, February 12 and March 7, 2019. Please see below for more details and RSVP information. FOOD: 5-5:30 p.m. | DISCUSSION: 5:30-7:30 p.m.
Speaker: Dr. Michelle Lem, Community Veterinary Outreach, Ottawa, Ont. Community Veterinary Outreach is a registered charity with the mandate of improving the health and welfare of both people and pets who are socially marginalized in our communities. Please visit https://www.surveymonkey.com/r/JNRC6QT to RSVP. FOOD: 5-5:30 p.m. | PANEL DISCUSSION: 5:30-7:30 p.m.
Dr. Hassan Vatanparast is an associate professor of Nutritional Epidemiology with a joint appointment in the College of Pharmacy and Nutrition and the School of Public Health. He teaches graduate and undergraduate courses such as Advances in Public Health Nutrition, Health Promotion, and Food, Culture, and Nutrition. Among his research activities, Dr. Vatanparast leads the SSHRC-funded multinational project Food Security, Culture, and Immigration comprising over 50 co-investigators, graduate students and research personnel. The project aims to provide a better understanding of food security status and social integration of refugees as well as aid policies and practices in Iran and Pakistan, the first points of entry, and at final destination in Australia, Switzerland and Canada. Mahli Brindamour is a general pediatrician with a special interest in global health and refugee health. She serves on the board of the North American Society of Refugee Healthcare Providers and was on the steering committee of Canadian Doctors for Refugee Care. She is the president-elect of the Canadian Paediatric Society Global Child and Youth Health Section, and a member of the Caring for Kids New to Canada Task Force. With the Saskatoon Refugee Health Collaborative, she co-founded the Refugee Engagement and Community Health (REACH) Clinic, where she provides regular paediatric care to refugee children. Dr. Kiran Banerjee joined the Department of Political Studies in 2017. His research addresses global migration governance with a focus on the normative role of international institutions and domestic political actors in responding to forced displacement. Banerjee’s broader research interests include political theory, international ethics, the history of political thought, international relations theory, and migration studies, as well as legal theory. He holds a PhD degree from the Department of Political Science at the University of Toronto, where he concentrated in the fields of political theory and international relations. Please visit https://www.surveymonkey.com/r/JXGWKRL to RSVP. Dr. Jenkins will lead an interactive discussion about communicating the animal and human health risks associated with Echinococcus to the public. E. granulosus and E. multilocularis are two tapeworms that can cause parasitic disease in animals and people. Dr. Emily Jenkins is head of the Zoonotic Parasite Research Unit and associate professor at the WCVM Department of Veterinary Microbiology. She is an associate member of the USask School of Public Health and an affiliate of the Canadian Wildlife Health Cooperative. She teaches veterinary parasitology, emergency management for public health and One Health to veterinary and graduate students. Her research takes a One Health approach to diseases that transmit among animals and people via food, water, vectors and the environment. Please visit https://www.surveymonkey.com/r/JM78HNR to RSVP. The U of S One Health Club’s members are U of S students who are interested in collaborating for the health of people, animals and environment – the One Health Initiative. The club’s activities and projects bring together students from different colleges to have inclusive collaboration. If you are interested in becoming involved, visit the One Health Club's Facebook group. The U of S University Library One Health guide is a resource for all those interested in One Health — the global movement to better understand the interactions between animal health, human health, and ecosystem health. For more information, visit the University Library website. The U of S offers a graduate certificate in One Health to students who are registered in the College of Graduate Studies and Research in a thesis-based master’s or PhD program. The program, which consists of six credit units, is to be completed during full-time enrolment during a one-year period. For more information, visit the U of S Course and Program Catalogue.